This is a really boring post. Just FYI. This is not a recipe so much as it is dumping a jar of Trader Joe’s alfredo sauce in a pot. And then adding green beans. 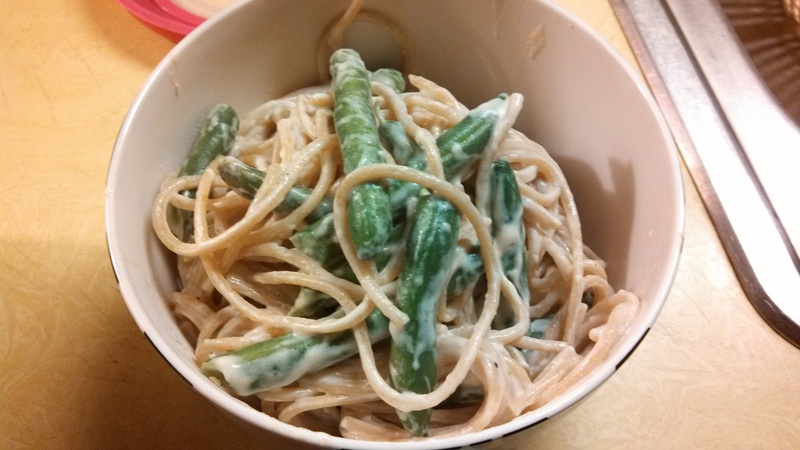 Funny story: for some reason I thought the green beans would cook in the sauce. They didn’t. They were warm, but raw. As someone who eats green beans all the time, I don’t know how this happened. But I still ate it (crunchy) and so did my husband. One thing that I do a bit differently with jarred alfredo sauce is that I cook it with the pasta, as opposed to in a separate sauce pan. When the pasta is done, I drain it (obviously), then return it to the pot. Then I dump the sauce into the pot with the pasta, and simmer on medium or medium low for several more minutes. The sauce is already “cooked” it just needs to be nice and warm. Also, I have no idea why I’m still writing this out like a recipe, since anyone can do this without needing to follow directions, but I’m trying to keep up with my blogging and displaying everything I cook – whether it’s from a jar or from scratch! -Cook pasta according to package directions, drain, and return to pot. -Cover pasta with alfredo sauce and mix well. -Let simmer on medium until hot, while stirring occasionally. -Pre-cook green beans (can do this by boiling for 2-3mins until crisp-tender) and add to pot.